TEHRAN, Iran (CNN) -- Iran's controversial president defended his government's relationship with the country's supreme leader on Friday, disputing charges of a political rift. 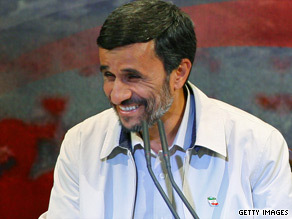 Iranian government said Ahmadinejad won two-thirds of the vote in the June 12 vote. President Mahmoud Ahmadinejad, speaking to a gathering in Mashad in northern Iran, rejected claims by people who have attempted to cast the relationship between his government and Ayatollah Ali Khamenei "as tainted," according to Iran's Islamic Republic News Agency. "They are ignorant of the fact that our relationship with the respected leader is far above the framework of politics and administration and is based on love and faith, and resembles the relationship between father and son," Ahmadinejad said. "The efforts of ill wishers to insinuate such doubts is fruitless, and they will surely take such wishes to their graves. This road is blocked to the devils." Differences between high-ranking Iranian officials over the controversial June presidential elections have stoked talk of a rift in the government and the Shiite religious hierarchy that rules the country. In addition, Ahmadinejad has been criticized lately by conservatives and opposition politicians for appointing a controversial politician, Esfandyar Rahim Mashaie, to the post of first vice president. Supreme Leader Grand Ayatollah Ali Khamenei ordered Ahmadinejad to nullify Mashaie's appointment, and Mashaie announced he would resign from the position. Ahmadinejad then appointed Mashaie presidential adviser and head of his bureau. Mashaie made enemies among Iran's fundamentalists when he reportedly said last year that the Iranian people are friends with all people, including Israelis. He was also criticized for attending a ceremony in Turkey where women danced on stage. In Iran, women are forbidden to dance in public and Iranian officials are expected to leave when such entertainment is provided for them while they are visiting abroad. Mashaie's daughter is married to Ahmadinejad's son. He is among the president's closest confidants and Ahmadinejad has defended Mashaie despite the criticism. The latest criticism of Ahmadinejad came during Friday prayers. Ayatollah Ahmad Jannati, the head of Iran's Guardian Council, criticized the move to make Mashaie a vice president and Ahmadinejad's firing of Cabinet members. Ahmadinejad is scheduled to be officially approved on Monday by the supreme leader and inaugurated Wednesday before the nation's parliament. Many Iranians believe Ahmadinejad's victory in the June elections was rigged, and the result prompted angry protests. People took to the streets Thursday to mourn the death during street demonstrations last month of Neda Agha-Soltan, who has emerged as a symbol of the post-election ferment. Agha-Soltan, 26, was shot during protests on June 20. Her last moments were captured on a shaky video, probably shot with a cell phone, that was seen around the world. More than 3,000 people came to a Tehran cemetery to mourn on the 40th day after her death -- a custom in Shiite Islam. Clashes broke out there and at other locations between police and demonstrators or mourners. One clash occurred at the Grand Mosalla -- a mosque under construction in Tehran. Press TV said that at least 50 Iranians were arrested when thousands of people gathered in Tehran, but most were released a short time later, a senior police official said. Mir Hossein Moussavi, the main opposition leader during the election, attempted to go to the gravesite but was turned away by security forces. On Friday, a Moussavi video surfaced on a Facebook site. In it, he defended the opposition movement and stressed the message that Iranians must return to the principles and ideals of the Islamic revolution in 1979. And he also made similar points in remarks published by the Iranian Labour News Agency on July 27.